I am realistic, I know that it would be impractical to leave them as they are or just as frames. I do think that redevelopment of the area should take the frames into account, there is loads of potential. The area does not really lend is self to a park, but there are many other options, even as retail. A developer would obviously need to take maintenance of the frames into account. In the long term, the guide frames will become much rarer as a vast majority of gasholders get pulled down. Then there may be regret that they were allowed to just be dismantled, without any real plans for the site. From the SGN site, Ofgem are apparently funding the removal of the holders across England and Scotland; 50% from a total of 110 are due to be demolished by 2021. I didn’t know that they are often filled with contaminated water, oil and sludge, and I expect it is the management of that which contributes to an onerous maintenance cost over time. Perhaps the worst case would be a leak in the base which isn’t readily accessible or easy to fix, yet could allow contaminants to pass into the land or ground water. I guess as the structure ages this becomes more likely. So while most of us look at the visible structure and wonder how much it can cost to maintain that, the true cost could be hidden from direct view. It’s just a guess though, and I must say that when I first saw them I thought they were an eye sore, but will probably miss them once gone. For a while anyway. 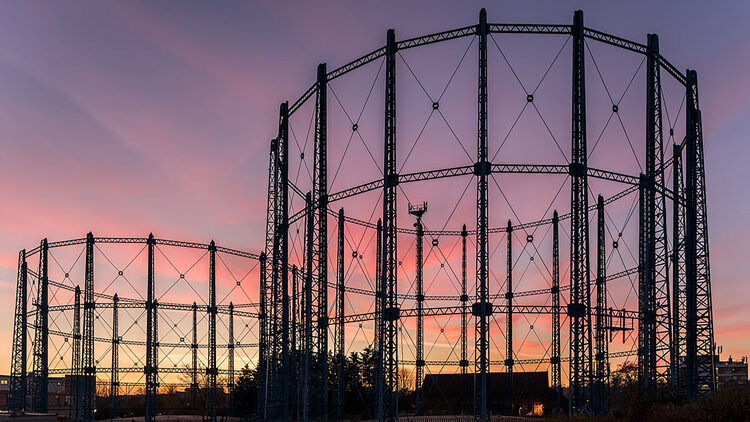 Will the UK's gas holders be missed? One by one the UK's gas holders are being removed. But will they be missed? My point was that the gas holders don’t make an area great enough in size to make a conservation area. The gas holders would need to be independently listed structures, either nationally or locally. This page sets out what conservation areas are and how they are designated and managed. Over the road is the Architectural Salvage business, which is in an Old Bath House (signage still at the front). Sadly, I have never found it open at a time when I think I could pop in (as usualy pushing a wide pushchair, but I can see from the road that there appears to be more to the building than the front, with a rear building with windows at the top. Presumably the old pool? Wouldn’t it be nice if this building could be restored as a public baths when the day comes that the building is empty and ripe for development? Old Baths might not have been a pool - it was a public washhouse and those often included swimming pools, but not always (Eg in central Wandsworth the baths were just that, the ones in Battersea were both baths and pool). Looking at old maps, it’s hard to tell from the shape of the building which it might have been (I’ve never been inside it either). Yes. A little more research suggests it was a ‘Slippers Baths’. So hot water and baths you could soak in. Quite important in time where heating and running hot water was scarce I suppose. I wonder how many survive? No. 65 carries the name ‘The Old Bathhouse’ (1907). This former slipper baths now houses an architectural salvage firm (pictured above), their opening times neatly shown in the centre of a fireplace surround — 11am-4pm, Tue to Fri. The roofline of the baths section can be seen from the open space behind the adjacent Bell public house. Interestingly, the section in that article also highlights the Art Deco building, now used by Coventry Scaffolding, which we could add to the list of things worth conserving. Nice James - is it mainly there start and end of the day? I had a quick look at lunch today but could not see it. Plenty of ‘bird food’ around! Around dawn it’s often sat up there. Probably every day, but I don’t always get the chance to look. Quite hard to spot too, as plenty of birds on the frames throughout the day. Several photos of it, I’ve only noticed it was there when I looked at the pics and zoomed in to check the focus. It seems to sit there and then fly off, usually before I walk past on the school run, past 8:30. So assume it has a pretty good view of most of south east London and is picking a hunting spot. Guess it’ll get earlier and earlier as the days grow longer. I’ve only seen it a few times later in the day, approaching sunset. But I used to photograph the starlings in Sainsbury’s car park and have seen them all take off and vanish at points through the day, which is usually a sign there is a predator around. The crows are not bothered. So it probably pops in a few times. I visited Kings Cross today. A third of the image on the left is a reflection from one of the mirrors in Gasholder Park. Beautiful. And not in their original location. Aye. Partial frame elsewhere on the site too. Listing helps focus minds of developers of course. I actually think our gasholders look nicer though. These are essentially solid tubes, with some ornate bits on. Ours, while less ornate, have more bits and pieces. I like looking through them as I walk past, seeing the frames merge in with each other. Seems ours are a fine example of the shift between the older and newer styles, designed by a man who was president of a couple of societies involving gas and engineering (Gandon). An alternative plan here, for the site holding the listed gasholder at Old Kent Road, with a Livesey Park, residential development and some discussion about reuse of the frame. exposing the underground tank (see Figure 100).